Do you live in one of the worst zip codes in America? Americans typically identify with their state or home town. If you’re from Texas, you brag about it. If you’ve made Los Angeles your home, typically, most of the people in your life are aware that you’re from L.A.
What about your zip code? Often, only the wise, shrewd home buyer is aware that within individual zip codes of America are individually-wrapped nuggets of information that can make the difference between a good place to call home and a great place to call home. Well, if you’re in one of the zip codes we’re about to highlight, odds are you don’t want to move. 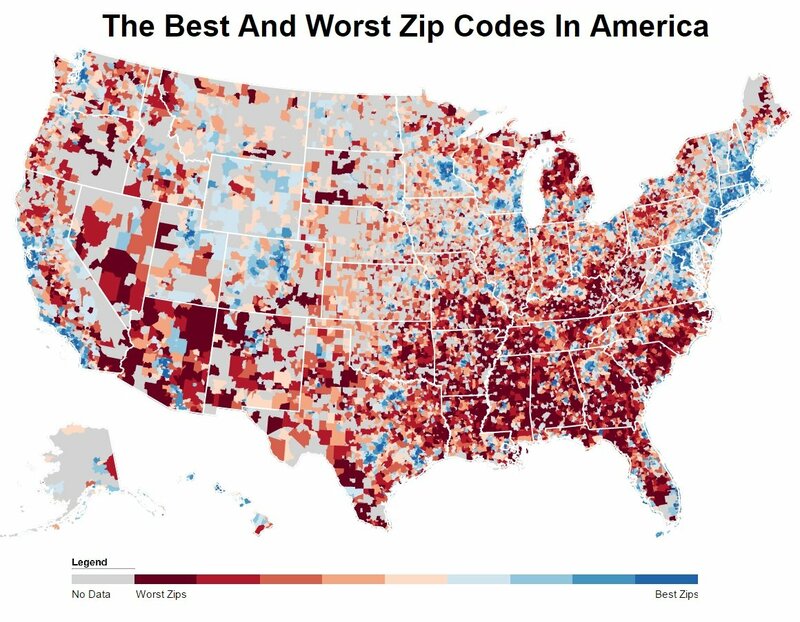 The purpose of this study is to use science to determine which of our American zip codes are the absolute worst. While unbiased, this research does take into account factors that almost all Americans would agree are desirable. Therefore, while you may have strong opinions either way, you can’t argue against the methodology. Turns out a Native American Reservation in Arizona takes the cake as the worst zip code in America. The best? You might not be too surprised that a zip code in downtown NYC has the best zip code in the country. So basically, rural areas of Arizona have the absolute worst zip codes in America. While that might not be a surprise (and a real downer from the perspective of small town Arizona), you can read on below to see how we crunched the numbers and how your zip code ranked or check out the best zip codes in America. How do you decide if a zip code is lousy or not? In order to rank the worst zip codes in the United States, we had to determine what criteria people like about a place. It isn’t a stretch to assume that people like low crime, solid education, things to do and a stable economy. So we scraped the internet for those criteria, asked for the opposite of those, and it spit out the answer. Like magic. If you’d like to see the complete list of the worst 100 zip codes, scroll to the bottom of this post to see the abridged chart. This might be a little unfair, but the middle of nowhere in Arizona is, statistically, the worst place you can live in the country, when measuring zip codes. As you might expect, tons of people are out of work, and just about everyone here lives in poverty. The zip code that includes little Batesville, Texas is also not a very charming place when you look at the data. ‘Only’ a third of the folks who live here are out of work, but just about every single person here lives far below their means on a monthly basis. The area near Blue Gap, Arizona has some issues for sure. In fact, half of the cities on this list are in rural Arizona. It’s actually shocking that in today’s America, communities can exist where folks bring in so little money. Homes in the Niland, CA area average about $50,000 apiece, which is understandable when you consider how little there is to do, entertainment wise, and hot hot it gets here for long stretches of the year. Only 3% of the community managed to go to college. The zip code that includes Manderson, South Dakota is one of two in the SD area where you might want to avoid. Considering that not a single soul in this entire zip code managed to go to college is a sign that times are tough here, and there’s very little stimulation. How on Earth do 2,000 people manage to make ends meet on half of what the government says is the bare minimum to live at the poverty line? And why are homes averaging $60,000 apiece in this rural chunk of Arizona desert? As you might imagine, rural South Dakota might possibly be the most boring stretch of land in the U.S. Factor in a population of just over 1,000 people that’s very poor and you have one of the worst zip codes in the nation. But you can buy a home for $21,000 if you wanted to. The name of this area says it all – it’s very hot, very rural and very poor in this zip code in Arizona, where the closest place to get groceries and gas means it’s well outside the interest level for 99% of Americans. Our area in the state of Arizona really isn’t that much different than the rest of the zip codes we mentioned above. Here, more than a third of residents are out of work, and those who manage to find work are paid very little. That makes it a very undesirable place to live. The first zip code to make this list from the deep south, the area surrounding 36471 has very little desirability when you look at the data. 3 in 10 residents are out of work, and homes cost about $53,000 each, a sign there’s little demand. Plus, as an added punch in the ribs, the average commute time to work from this zip code is about 26 minutes. Yikes. Like we said earlier, trying to determine the worst zip codes in America is usually a subjective matter. But if you’re analyzing zip codes with the worst economic situations, where there’s high crime and little jobs, this is an accurate list. If you’re curious enough, here are the best zip codes in the USA, according to science.